Service recovery occurs when your normal business operations fail a customer in some way and you must intervene to resolve the customer issue. Perhaps you missed a deadline or they were provided with the wrong information or even delivered the wrong product or services. In these situations how you recover from the error is critical in winning back the customer’s loyalty. There is even research that indicates that customers who have a problem and have it resolved quickly and appropriately are more loyal than customers who have never had a problem in the first place. In the transactional customer feedback realm the react process can also generate high levels of employee engagement and creates organizational stories that help drive the long term implementation success. And of course they fix customer problems when they occur and drive up customer loyalty. Typically this is added as a tick box or a yes/no question at the end of the survey document itself. You will find that happy and unhappy customers, or Promoters, Neutrals and Detractors in Net Promoter surveys, will all make use of this box. For unhappy customers you can use this question to kick start a process to reverse their perceptions and for happy customers it is often a sales opportunity. Occasionally when we implement this question, clients ask whether it would be better to just leave it out and contact all low scorers. Initially that can be a good idea but long term we recommend against this because putting the question in allows you to follow-up Promoters as well. Ticks Yes Call them and start your react process to resolve their issue! This is someone you would not have called but now you know they want you to call: bonus. Often there are additional sales involved in this call as well: double bonus. Ticks No Disappointing but you know what they want you to do and you should respect that. At least you tried. In reality there are very few of these responses. You were not going to call them on this survey and that’s fine: no change. No Tick You should probably call them and commence the service recovery process. You can still call them if you think it is useful. So it’s really only scenario 2 (low score, ticks no) that is at odds with what you want, but it’s what the customer wants. Plus, in practice this does not happen very often so it’s a small loss for the upside of scenario 4 (high score, ticks yes). Also this question drives automated service recovery which means you get scenario 4. as a feature. If you don’t have it then customers will have no easy way to ask you to contact them. This is a good way to initially run the service recovery process because you can throttle the number of respondents that you action without them knowing it. Consider what will happen if you give respondents the opportunity to request a contact and you don’t action that quickly and efficiently. You will have increased their expectations and then failed to deliver. This is a very negative outcome, especially if they are already a Detractor. Starting out by leaving off the “please contact me” question allows you to build your process carefully and test it out before you go public. When you are happy that you have the right staffing and support in place to quickly and efficiently respond to feedback requests, you can add the question. Before ramping up to full production, test your service recovery process on small numbers of survey respondents. That will allow you to iron the kinks out of the process before going full scale. You can test and correct your process in a controlled and low volume environment without the added pressure of having to respond quickly to everyone that requests support. Step up: Add the “please contact me” Box. When you go live on this box prioritize these respondents in your service recovery process. You need to get back to them quickly: the same day ideally. If you do not respond to them or do so too slowly you will turn a bad situation (a 1 or 2) into a zero and confirm their low opinion of you long term. On the other hand if you manage the service recovery process well you can turn a Detractor into a Promoter for life. We’ve seen this happen at our clients. All this service recovery costs real money: staff need to make calls to customers, take actions, resolve issues. This costs the organisation. For the whole process to be of valuable the benefits must outweigh the costs. So do some analysis of the value that it generates. Estimate the value of the intervention, even an approximate value is better than no value at all. After doing this analysis one of our customers determined that the revenue benefit of this process far outweighed the cost. Then it was easy to get management support to grow the service recovery team. Another client could not work out why 0s, 1s, and 2s (on the “would recommend” question) were more valuable than 3s and 4s. That was until someone realised that the 0,1,2s were receiving service recovery calls but the 3s and 4s were not. So have you implemented the React process? Please share your successes in the comments below. In this last section where you state: “Another client could not work out why 0s, 1s, and 2s (on the “would recommend” question) were less valuable than 3s and 4s. That was until someone realised that the 0,1,2s were receiving service recovery calls but the 3s and 4s were not.” did you really mean that they could not figure out why the 0s,1s and 2s were MORE valuable? We have a robust process for service recovery (aka “closed loop call backs”) at our company and have found customers are usually very pleased that we reached out to correct any issues or concerns. The process also acts as a robust data collection process for customer painpoints (we all know how few customers actually provide specifics in a written survey). The process does come under pressure often to “prove the value / justify the investment”. Continued customer behavior and financials analysis helps. Also, with respect to asking if they want to be contacted, another thing to consider: if we can’t change what the customer is dissatisfied about, it can become a contact that adds “salt to the wound”. That is why we like to leave the decision to call back at our discretion instead of using the question, which commits us to a call back. In one of our service recovery groups that decided to add the question to their survey, they have opted to add it only to specific surveys – leaving out the contact reason categories that are most likely to be issues that cannot be resolved further due to regulations and business credit policy (e.g. denied credit line increase requests). It is a waste of our time and the customers time if we have already done all that was possible and the customer is simply dissatisfied with the answer. Yes — you are correct I really meant “more”. Thanks for the pick-up and I’ve fixed it now. Your experience is the same as our clients’: customers are surprised and happy to receive the call. Even the most negative scores can be turned around. I often talk about the need to create and ROI case for all things CX. This is no exception and not creating that case it often the reason for resources being removed from the service recovery process. Your last point on “if we can’t change it there’s no point calling” is a good one and something we have seen as well. I know at least one of our clients runs a similar filter before taking action. I really enjoyed reading the artical, thank you! Im in the process of inplementing Service Recovery and would like to know the best way to measure the success of the recovery. We are currently calling all detrctors 0-6 with 30 mins if recieving the result..
My thoughts are to survey the detracors again after the recovery call, with a similar questions then compare results. 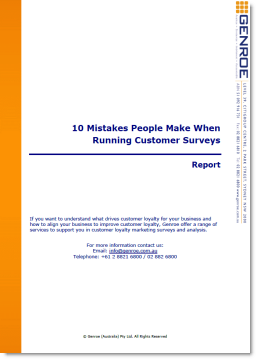 The idea of re-surveying customers is attractive but I’m not sure how effective it is. If you are trying to determine if the intervention itself was good then it may be a good approach. On the other hand if you’re looking to assess your base process then comparing scores (or value) between interactions for the same person is probably a better approach. We have had customers perform this type of analysis and see nice improvements.